Henry Holt and Co. (BYR), 9780805087932, 32pp. In the late 1800s, former slave and veterinarian Bill "Doc" Key realized that his new foal, Jim, was no ordinary horse. Believing in the power of kindness and patience, Doc taught Jim to spell, recognize the primary colors, and even make change from a cash register! Performing in shows across the country, Jim stunned audiences with his incredible skills. But when some people called Jim a fake, Doc set out to prove them wrong and to show the world that, thanks to the power of kindness and patience, Jim was truly a wonder horse. 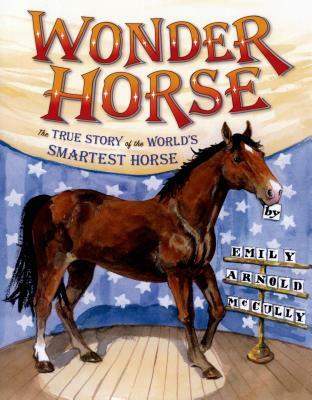 Caldecott Medalist Emily Arnold McCully's account of this fascinating, true story comes alive in her striking illustrations.Wonder Horse is a 2011 Bank Street - Best Children's Book of the Year.